It is a photograph which has courted controversy similar to Frank Searle and Tony Shiels and has divided opinion between Nessie cryptozoologists. I am referring to the picture taken by Peter O’ Connor on May 27th 1960 at Loch Ness. The image is immediately recognisable amongst the lake cryptid community, but has been questioned by a sizable number of them. If a democratic vote amongst cryptozoologists was all that was needed, then the photograph may well have been consigned to the dustbin of research a long time ago. Be that as it may, the story and picture first came to light in the 16th June edition of The Weekly Scotsman and added to the rising interest in the Monster generated by the Dinsdale film only three days before. Reaction to the picture was of course mixed. Tim Dinsdale was favourable to it in his book "Loch Ness Monster", but Maurice Burton dismissed it in his work, "The Elusive Monster" implying it was a hoax. So, it would be appropriate to first recount the story from the man himself. Peter O' Connor wrote an account of his photograph to Tim Dinsdale, which was printed in the first edition of his book “Loch Ness Monster”. This is reproduced below. Between 0600–0630 hours I left the camp (1 mile N.E. of Foyers Bay) and went N.E. for 100 yards. The Loch Ness Monster glided around the headland at a fast walking pace. I waded into the water to get as close to the route it intended passing as possible. I was waist deep and decided to go no closer as it had turned its head in my direction and I am sure it knew I was there. For a moment (a horrible one) I thought it intended coming towards me. I watched its head closely. It had small sheeplike features set on a very, very, strong neck - the muscles kept rippling in it, reminding me of a panther's leg when pacing a cage. The head was approx. 10 inches long, the neck 6-7 inches in diameter increasing in thickness towards water - there was 2-3 ft. exposed and behind the neck was a large hump or body, greyish-black in colour. Where I expected limbs (i.e. Plesiosaurus) I saw the occasional swirl of water indicating them. I saw no eyes, but its facial structure suggests it has them, but its 'lids' were shut. The skin appeared smooth, as on a seal, but could have been fine scale. When I took the photograph with a flash bulb inserted, I turned and yelled to my companion who was lying in the tent (the tent was built so a view of the loch could be obtained in any direction, i.e. no walls except cliff), and as I did so I gave the camera a couple of turns and took another photo of it disappearing with a great deal of commotion in the water. My friend said he saw something black for an instant and the water disturbance, which was not small. I was within 25 yards of the creature when the photograph was taken, I am not sure if the light or my voice frightened it—one or both did. I am not fully satisfied that it was the same creature as seen on Wednesday May 24th, as it was smaller and a different colour. I think both skins were wet or at least damp - one on Friday certainly was. I do not know why I was frightened of it as it reminded me of a docile swan - perhaps it was the power it had at its disposal and the fact it was an unknown quantity. If we compare this to the report which appeared in the Weekly Scotsman, there is no material difference in the account. However, the newspaper adds some speculation that the creature was 50 feet in length, 50 tonnes in weight, lived at a depth between 40 and 150 feet and liked to bask on the surface! I doubt all that was deduced from this one photograph and was rather O' Connor's own independent speculations. The newspaper article only served to heighten interest in the Loch Ness Monster coming off the recent publicity of the Dinsdale film which made its public debut on the BBC programme, Panorama. However, the newspaper printed a picture of Mr. O’ Connor, which may interest readers. Now, in the sceptics’ mind, two statements will fire through their brains. The first is “Too good to be true”, followed by “Fake Photograph”. But then again, all Nessie pictures for them fall into either the “Too good to be true” or “Too vague to be conclusive” categories. One thing is for sure, this photo is either a hoax or the real deal. I see no room for misidentification here. The “Cheeky Chappie” look on O’ Connor’s face will no doubt persuade critics further that he was up to no good. After all, had he not committed one of the “Seven Sins of the Debunkers” when he had previously joked about his upcoming visit to the loch? To wit, the Sunday Express for the 4th October 1959, ran an article on O’ Connor’s plans for an expedition to Loch Ness to capture the animal, dead or alive. To the Editor 'The Glasgow Herald' October 13, 1959. Sir,—It was with a feeling approaching consternation that I heard yesterday evening on the Scottish news the recording of an interview in which a group of people from Gateshead intimated their intention of killing the Loch Ness Monster. Had the announcement come from the Fellows of Regents Park I might have taken a less histrionic but equally stern view of this. The news, however, that the lads of Gateshead were planning to come north with bombs and Bren guns causes one to regard this zoo quest as something verging on a national affront. I heard a young man interviewed say, seriously enough, that there was no alternative to killing the monster. This is a strong statement and one is obliged to inquire what harm the monster has done. It is locally popular. It has not eaten its way through the maidens of Drumnadrochit in a like manner to that southern dragon the English saint had to put down. ANDREW BEVIRIDGE. 9 Evan Crescent, Giffnock. He had nothing to fear as O’ Connor was just cracking a joke. Indeed, it may have been that O' Connor was referring to a previous expedition when he made this quip. However, that was enough for some Loch Ness researchers to close the case on his later photograph. Well, I guess that implies they had never cracked jokes about monsters and monster hunting? Aye, that’ll be right, as we say in Glasgow. The funny thing is, I have read sceptical Loch Ness researchers comment that reputations count for nothing in the world of Nessie photos. For example, take the case of the other vilified Nessie photographer, Peter MacNab. Respected author, president of the Clan MacNab Society, local councillor and bank manager count for nothing it seems. So, logically, Peter O’ Connor’s reputation should count for nothing as well? Not quite it seems. Oh well, whatever it takes to win the case. But this article is not just about Peter O’ Connor. You would have noticed that a Maurice Burton was named as an adviser to O’ Connor and that seems to have been the beginning of a less than fruitful relationship. It was Maurice Burton, more than anyone, who had the most to write against this picture. Here we concentrate, not on arguments for this being a monster photo, but on arguments against this being such a photo. For you see, when arguments are made for and against, one could imagine a pendulum swinging towards "hoax" or through "inconclusive" towards "real" as the debate ebbs and flows. Maurice Burton stated his case and ever since the pendulum has spent most of its time beyond "inconclusive" in the "hoax" area. On the other hand, if one can demonstrate such an argument is on shaky ground, then the pendulum starts moving back towards the "inconclusive" and perhaps beyond to the other side. That depends on the individual and their own bias and prejudices (which I hope I don't have to prove occurs on either side of the overall debate). Maurice Burton (pictured below) was a well-known naturalist who lived through much of the Nessie era since it beginnings in 1933. He was a popular author on wildlife and helped to popularise science through the publication of various books and media appearances. Such was the regard in which he was held that he regularly corresponded for the Daily Telegraph and the Illustrated London News. I suppose he was a kind of precursor to the BBC's David Attenborough. His obituary can be found here, although like a lot of deceased Nessie-related personalities, their eulogisers tend to airbrush out that particular monstrous association. Interestingly, this obituary was written by Denys Tucker who more than once crossed swords with him over the Loch Ness Monster. When the Loch Ness Monster came to the world's attention, Maurice Burton was not quite in the public view and was curator of sponges at the British Museum. Despite the museum's sceptical stance, this young man offered his opinion to the Daily Express in 1934 that the creature may in fact be a walrus and so began an interest in the monster that continued in various forms until his death in 1992. However, years later, Burton denied that he had said the monster was a walrus and tells us that he in fact at the time believed it to be a giant eel. So it seems that he believed in some kind of unknown animal in the loch from day one. By the time he left the position of Deputy Keeper of Zoology for a writing career in 1959, it looks like he was more inclined to the plesiosaur view of Nessie but that position was soon to crumble as he headed to the loch with a team in 1960 to perform his own investigations. The following year he published "The Elusive Monster" which was an attempt to explain the various reported sightings of the creature as misidentifications of otters, rotting vegetable mats and other objects known to be found around the loch. The Express article stated that Maurice Burton was described as an "adviser" to Peter O' Connor and his upcoming expedition. It seems that there was some kind of cryptozoological relationship between Burton and O' Connor but this should not surprise us as Burton was very much regarded as a leading authority on Nessie to whom others would seek wisdom. In fact, Tim Dinsdale himself (who lived about forty miles from Burton outside London) had made contact with Burton before his 1960 trip to Loch Ness and one of the Burton family had lent the cine camera to Dinsdale with which he shot his famous footage. Indeed, the first ever mention of Tim Dinsdale in a monster context is in an article by Burton in 1959 when he makes reference to Dinsdale's analysis of the best sightings - an analysis which later made it into Dinsdale's book. 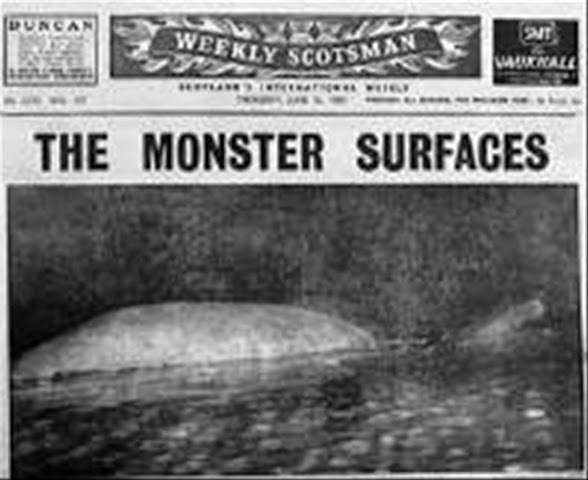 So it seems that around October 1959, Burton was still a believer because in that O' Connor article, he talks about Nessie in familiar creature terms. Indeed, when Tim Dinsdale headed north in late April 1960 with the Burton camera, one may presume he was also of such a mind else he would not have lent the camera. However, by the time he reached Loch Ness in June 1960, he was there to seek out evidence for his embryonic book and I think the driving force behind that trip were the recent images taken by his "students", Dinsdale and O' Connor. When the expedition was over, Burton had built his case against his former students and he could now progress with his book. But the mystery is why Burton had so quickly turned against the Loch Ness Monster despite this new evidence from his own students coming to light? Surely now was the time for him to consolidate his place as a recognised Loch Ness expert, back up Dinsdale and O' Connor, write relevant works and generally make a name for himself? But the exact opposite happened and we need to sift around to find out why. Given Burton's stature in the cryptozoological world, it is not surprising that others have mused on this "volte face" by Burton. A clue may lie in an article Burton wrote for the Sunday Express on the 2nd August 1959 entitled "Is there really a Loch Ness Monster?". In this article, Dr. Maurice Burton is presented as the Deputy Keeper of the British Museum. The article itself is revealing as Burton talks favourably of the plesiosaur theory and berates his zoological colleagues for hiding behind their reputations and not taking a risk in the matter. Nine weeks later in our aforementioned 4th October article on Peter O' Connor, Burton is described as the former Deputy Keeper. Could it be that Burton's criticism of his academic peers was the last straw for them? The polite version is that Burton left for a writing career, but one would have thought you could do that and continue to hold a prestigious academic position. The only question for me was whether this was a dismissal or resignation. Indeed, recent revelations on his colleague, Dr. Denys Tucker, show that he was dismissed from his post at the Natural History Museum in July 1960. We may not know, but was a similar dismissal of Burton the catalyst to get at the cause - the Loch Ness Monster? Or rather indirectly via two of its main proponents and his former students. The book itself was written about the same time as Tim Dinsdale's "Loch Ness Monster" but the prevailing tide of public opinion was moving towards a large creature in Loch Ness and so Burton's book was generally ignored and taken to task by such Nessie authors as Ted Holiday. One problem with Burton's book was his disproportionate preoccupation with vegetable mats as an explanation. As it turned out, such objects are exceedingly rare on Loch Ness and water bailiff, Alex Campbell, could only recall seeing two such mats in his forty odd years (and even then it was clear what they were). Later research by Adrian Shine and the Loch Ness Project proved that low decomposition rates in the loch precluded such a phenomenon except in certain localities around Urquhart Bay and Fort Augustus. However, Burton's campaign against any exotic creature in Loch Ness went on until his dying day and his line of scepticism continues to this day in a modified form amongst other such minded people. Having given of his time to help O' Connor, Burton did an about turn and went on the offensive. Burton first raised two objections to the photograph. The first was that it looked too dark for the stated time of day. The second was that the lighting elevation appeared to suggest a height of twelve feet rather than the two feet or so that would be inconsistent with O' Connor wading waist high in the water. These objections will be examined in a later instalment of this article. However, the final nail in O' Connor's coffin seemed to have been hammered in when Burton unveiled more revelations when he stated that his expedition had gone to O' Connor's camp site two weeks after he left and found evidence of deception. That particular information is embedded within a general diatribe of the monster which is somewhat arrogant and dismissive in its delivery. When a "believer" becomes a "sceptic", they can sometimes turn out to be the most vitriolic opponents of the mystery. Regarding the Hugh Gray photograph, he says the contact positive plates, "show clearly that his supposed 40ft monster was a common otter rolling at the surface." How many sceptics agree with that interpretation today? Likewise, he concludes the Surgeon's Photo is the tail of an otter diving back into the water. He quotes the RSPB director, Peter Conder, who dismissively states "I do not think anyone can have any doubt at all that the surgeon's photograph was one of an otter ...". Another "expert" interpretation that was proven wrong and shows that just because someone is an expert, does not mean they will avoid talking nonsense. With an air that makes us all wonder how we did not see it all before, Burton says the Peter MacNab "is simply a stern wave from a ship that has passed a short while before ..." and the Cockrell picture is just a stick. Dinsdale's film is dismissed as a boat and he names Jock Forbes as the pilot (however, my own recent enquiries to his son, Donald, suggest his father did not use a boat at all). Against this backdrop, O' Connor was not likely to be exonerated. The visit to O' Connor's campsite is described in a letter to the New Scientist for 23rd January 1969. The relevant portion is reproduced below. Burton adds more details in a New Scientist article from the 24th June 1982 where he states the following in the extract below. In this he adds that he found the very pump nozzle used to inflate the alleged monster. P9 was published on 16 June 1960, just before Burton and his team arrived at Foyers. Naturally it was discussed among the guests at the hotel, some suggesting that it was a half-submerged but inflated sack. Burton ignored the picture, which he thought unconvincing, but the gillie who took him and his family out in his motorboat for occasional excursions insisted on taking them to what he called 'O'Connor's Cove'. On landing they found abundant signs that someone had camped there; ashes from a fire lay about and a bivouac had been made by tying down the lower branches of a small tree (with an unusual kind of red-and-white string). There were used flash bulbs and charred fragments of what must have been several white plastic sacks! One of the party, who had decided to paddle in the shallows, tripped over some red-and-white string (the same) which turned out to be attached to half a dozen rocks each about 25cm across and forming a circle about 1m in diameter. It was clear that someone had inflated a plastic sack and weighted it around the edge with stones. The head and neck of the 'monster' had consisted of a stick which Burton and his party missed because it was lying in the bivouac, but it was discovered shortly afterwards by retired journalist Angus Forbes. Unfortunately the stick was lost when Forbes attempted a reconstruction of the mode1. So do we move on like the sceptics? No, I think there is more to say on this matter. The case seems such a foregone conclusion and subsequent sceptical researchers have just repeated what Burton has claimed and added little else. But there are problems with his story which I will now explore. The first and biggest one stands out like a sore thumb. Burton and his family were at Foyers from at least the 19th to the 27th June while O' Connor's photograph had previously went public on the 16th. He went on to write about this expedition in his 1961 book, "The Elusive Monster" and included photographs taken during it. However, when his book gets around to discussing the O' Connor photograph, it completely fails to mention the saga of the beach findings and all we get is a brief paragraph on how the photo is too dark and the flash bulb too high. So, let me get this straight, Mr. Burton. You went to the beach. You found the remains of plastic sacks, a pump nozzle, a bunch of used flash bulbs and a stick that looked like the head-neck. You even reproduced a similar photograph. You have multiple witnesses to the event and you .... do not print one solitary word about this in the book describing the expedition and critiquing the photograph? Talk about snatching defeat from the jaws of victory. Or perhaps there are unseen issues here? It's a no-brainer to print all these revelations, but instead we have to wait another eight years to see anything about it in print. Is this an "epic fail" to quote the vernacular? Perhaps Burton was afraid that O' Connor would sue him for calling him a hoaxer? That seems to be the suggestion in communications I had with another researcher. Burton claimed O' Connor threatened to sue him if he said anything against him or Dinsdale; so Burton said he pulled this account. But this is just nonsense, don't the other objections to the photo made in his book make that same accusation and Dinsdale certainly did not escape Burton's withering analysis? So, let's just conclude that Burton's lawsuit reason is actually no more than an excuse! Comparing the quote from "The Loch Ness Monster: The Evidence" with the New Scientist articles, the second issue arises. In the 1969 New Scientist article quoted above, Burton claims he convincingly reproduced the O' Connor photo using a polythene bag and the stick he found at the camp site "that looked identical with the neck and head of O' Connor's monster". Unfortunately, for Burton, he let the cat out of the bag by admitting to Campbell that he never had this head-neck stick. It was allegedly discovered later on by a journalist who lost it himself. In other words, the story about reproducing the picture with the stick is false. So, it is no surprise this "convincing" reproduction has never been published and I wager never shall. What we do have is a truly awful reproduction that Burton made at Loch Ness and had published in the Illustrated London News dated July 23rd 1960. This article was essentially a report on his week's trip to Loch Ness. In that article he talks about the various objects and conditions that can deceive the observer, but again he makes no mention of findings at O' Connor's campsite. Perhaps he was also afraid O'Connor would sue the Illustrated London News!? As part of his photo compendium he reproduced the picture below using a rock and a stick. Now I would not call this picture convincing of anything. One wonders why he did not use the O' Connor reproduction which did "not differ in any significant way from O' Connor's picture"? The answer? Because it did not exist. Moving onto the general items of "evidence" at this campsite, we have three lists described by Maurice Burton in separate publications. In his 1969 piece, he mentions the remains of three large polythene bags, a circle of 9 inch rocks, a stick and red-white string. His 1982 article mentions remains of white plastic sacks, a pump nozzle, the stone ring and the stick. His final conversation with Steuart Campbell produces a third list of used flash bulbs, charred fragments of several white plastic sacks, the stone ring and red-white string. Does this actually mean anything that leads one to a solid deduction? The logic applied here clearly attempts to synergise separate objects into the concept of a larger whole (a hoax). However, the argument relies on these smaller items having clear, designated functions. Firstly, used flash bulbs on the beach carries no compelling argument as to a sinister use. It merely implies that photographs were taken in conditions of low light levels. We know two such bulbs were used in the reported incident, what the others were used for has a multiplicity of possible uses. Burton gives us no information with which we can draw our own conclusions. How many bulbs did he see lying around? Five, ten, twenty? What did he see that suggested a sinister and not harmless use for them? Nothing would be my conclusion based on what he said. Regarding the charred fragments of white, polythene sacks. Again, Burton is unclear in what he states. The so called sacks were not complete but rather charred fragments. Could he actually tell how big they originally were and what their overall shape originally was? Instead of positing inflated monsters, it would be simpler to read the text of the description of the camp to come to another conclusion. I note Burton says a branch was tied down to form a bivouac. This implies O' Connor brought no tent but improvised a shelter. That required some material to form the covering - such as plastic sheets or canvas. I think O' Connor brought polythene sheets to form a bivouac with and simply burnt some or all of them when he decamped. Burton was allowing his desire to find a monster hoax colour his interpretation of the scene. What about the pump nozzle? Well, what about it? I take a pump nozzle with me when I camp at Loch Ness every year. However, it is not used for any sinister purpose. I use it to inflate the airbeds we sleep on! They had inflatable camp beds in 1960 which were pretty much similar to what we have today. Again, there is nothing sinister here which does not have a simpler, more innocent explanation. The final item is more interesting and that is the submerged stone circle with the red-white string. Burton connects the circle with O'Connor because the red-white string was also found tying up the bivouac. Burton hypothesises that the arrangement of stones was used to weigh down a suggested inflatable monster. Okay, there is an immediate problem with this interpretation. We have a circle of stones and we have a monster picture. The impression I get from the photograph is of a body that is not describing a circle but an ellipse where it interfaces with the water. I would suggest you cannot create an elliptical object from a circular base. You will get into all kinds of trouble trying to do that in water only a few inches deep. In fact, since critics of this photo like to employ Occam's Razor in a rather indiscriminate way, why don't I suggest a simpler reason for a circle of stones at a campsite? I photographed this object at the area of the O' Connor site last year. It is a campfire and you get them all over Loch Ness from wild campers. They existed before Peter O' Connor turned up at Loch Ness and they continue to be built to this day. But, some overheated sceptic may jump in at this point and tell me O' Connor's stone circle was underwater. It was, and barely so according to what I have read. The reason I do not regard this as a problem is the two pictures below which I took with one of my trap cameras back in 2011. As you can see, the loch level can differ substantially even after two days. The water level of the loch can go up and down according to the inflow of waters from its many rivers and streams. In fact, it can go up or down by as much as seven feet. My simple contention is that O' Connor built a campfire that subsequently was submerged by rising loch levels. This is borne out by the rainfall figures from the nearby Nairn weather station for May and June 1960. May 1960 had a monthly rainfall figure of 7.9 mm which was very low. In fact, the records go back to 1931 and May 1960 was the fourth driest month in 29 years. Looking at the rainfall for June 1960 (when Burton was there), the figure was 78.5mm. That gives a rainfall increase of 70.6mm. Comparing this with other monthly differentials makes it the 41st highest climb in rainfall out of 1000+ data points. That would suggest that Mr. O 'Connor's camp fire was going to be submerged. And what about that red-white string tied around the stones? I don't know, but I do know it has nothing to do with monster hoaxes. The stone circle was likely on dry ground when O' Connor was there, but comments are welcome. My own opinion is that this is another "over-interpreted" statement from Burton akin to his words about finding the head-neck stick and photographing a near perfect reproduction. That you have asked the question suggests that you have not read "Elusive Monster". I have nothing to add to what is in that book. Well, the book says nothing about what I asked and Robert's terse reply suggested he thought there was nothing to add beyond it. I would agree with that, there is nothing to add against the O' Connor picture beyond the 1961 book. Nevertheless, Dr Burton would have to produce evidence for the existence of the all too easily found polythene bag before I would believe him. In the original text from "In Search of Lake Monsters", the last word "him" is italicised. Costello had looked at Burton's other pronouncements and the runaround he had given him on the G. E. Taylor film and come to his own conclusions.You can find similar words directed at Dr. Burton by Roy Mackal in his book when he discusses the same film. Of course, it all seemed strange that O' Connor was so cavalier in leaving so much alleged evidence of wrongdoing. It all seemed so convenient and Peter Costello knew it. Given the false flag episode with the stick photo story, I can see Costello's issue with whatever bold statements Burton would make. In his The Loch Ness Monster: the Evidence (New York: Prometheus Books, 1997[4th ed. ], p.56) Steuart Campbell refers to a letter sent to him by Dr. Burton in which he stated that a short while before [the filming] there had been a newspaper report of a four-horned monster in the lake, which was later identified as the bloated body of a horse. This indicated that he thought that the Taylor's object was this same dead horse. However, a German researcher and the editor of a magazine BILK, Ulrich Magin, claimed (in one of the issues, which I don't have with me at the moment) that there was no such newspaper report about the horse's body, implying that Burton was mistaking. I would concur that I have never seen such a report either. Whether Burton lied or just got muddled is beside the point, Costello was right when he said more demands should be placed on Burton when he made statements about Loch Ness Monster cases. Whatever you may think about this photograph, I suggest you do not rely on what Maurice Burton said about his visit to the O' Connor campsite back in June 1960. There may be other objections, which I shall come to, but this is not one of them. Debates about monster photographs or films do not merely focus on what the "believer" side of things say and do. There is also the small matter of what the sceptics are saying. Burton has made pronouncements about this photograph going back fifty years. Nobody (as far as I know) has made an attempt to critique his arguments. Sceptics rarely take on others from their own camp. Perhaps they want to show a united front against those silly monster believers. Unfortunately, closing ranks does nothing for critical thinking and that problem continues today when you see sceptical forums which are more dedicated to bashing "believers" than critiquing the barmiest of arguments that lightweight sceptics post. Self regulation appears not to work in these instances.